Good soles are much like tires for a car. There are always cheaper brands out there and someone willing to replace them for next to nothing. But cheap tires can ruin the drive of a luxury automobile and always end up failing sooner than later. Shoe soles are the same. 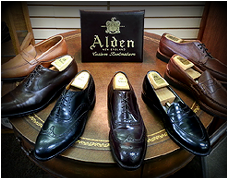 If you have invested in a fine pair of shoes, Alden, Allen Edmond, Crockett & Jones, Churches or John Lobb etc. 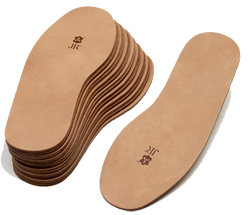 then you want your soles replaced with JR.
Oak-bark tanned leather sole from Joh. Rendenbach ("JR") in Germany. Because of the tight grain of an oak-bark tanned leather soles, they wear longer and require more infrequent replacing. If you are looking to resole your shoes with the best leather sole available, then, without a question, go with the J. Rendenbach oak-bark tanned sole. At JR Leather they work hand in hand with nature to ensure their leather has the comfortable wear, durability and active breathing that their customers so value. We steadfastly employ the century old method of traditional ground-tanning, work exclusively with first class raw material from Europe´s best and most expensive provenance and subject the entire production process to a stringent quality control. Traditional oak-bark ground-tanning is a process involving biodegradable tanning agents such as bark and fruit. This ecological tanning method results in an especially long lasting and dermatologically kind product. Leather with the JR-Brand label is waterproof and extremely abrasion resistant, tough yet flexible, very comfortable to wear and optically distinguished by its attractive grain and warm, woody colour.